Validate technical skills and expertise with an industry-recognized credential and grow your career. AWS Certification helps learners build credibility and confidence by validating their cloud expertise with an industry-recognized credential and organizations identify skilled professionals to lead cloud initiatives using AWS. Learn more about the value of AWS Certification. Register for the new AWS Certified Alexa Skill Builder - Specialty exam, the industry's first and only certification to validate your ability to build, test, and publish Amazon Alexa skills to reach millions of customers. AWS Certification expands its global reach through Pearson VUE's extensive network of over 5,000 testing centers in 180 countries worldwide, making testing even more convenient for customers to get certified. We've made it easier for you to prepare for AWS Certification exams with seven new on-demand Exam Readiness courses—built by AWS and available now at no cost. Prepare for certification exams with training and materials that complement your hands-on AWS experience. Claim benefits to help showcase your achievement and advance your AWS expertise. Maintain your AWS Certified status. Recertification helps strengthen the overall value of your AWS Certification. We offer role-based certifications to validate expertise for those in Cloud Practitioner, Architect, Developer, and Operations roles, plus Specialty certifications to validate advanced skills in specific technical areas. 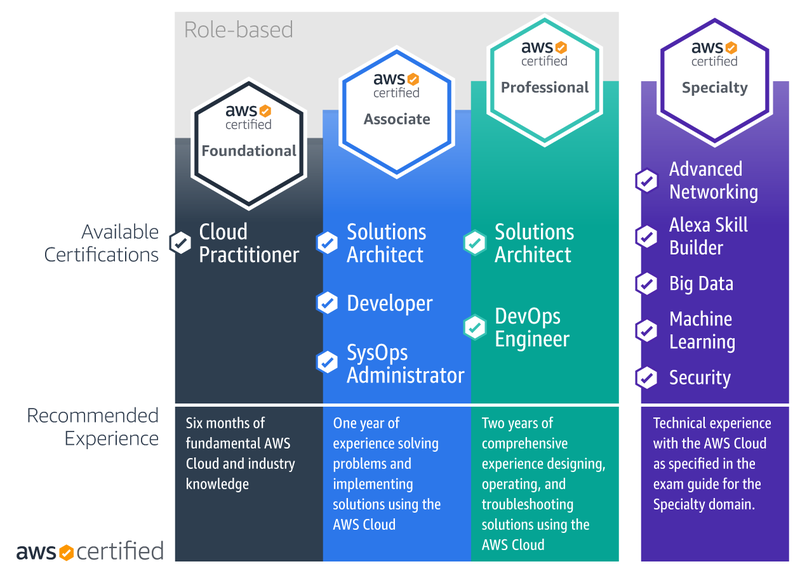 View our learning paths to find training to help you build skills and prepare for AWS Certification. This certification provides individuals in a larger variety of cloud and technology roles with a way to validate their AWS Cloud knowledge and enhance their professional credibility. This exam covers four domains, including cloud concepts, security, technology, and billing and pricing. This certification validates your ability to effectively demonstrate knowledge of how to architect and deploy secure and robust applications on AWS technologies. This exam is for anyone with at least one year of hands-on experience designing available, cost-efficient, fault-tolerant, and scalable and distributed systems on AWS. This exam validates your ability to effectively demonstrate knowledge of how to architect and deploy secure and robust applications on AWS technologies. We recommend candidates have at least one year of hands-on experience designing available, cost-efficient, fault-tolerant, and scalable and distributed systems on AWS. This certification validates proficiency in developing, deploying, and debugging cloud-based applications using AWS. This exam is for anyone with one or more years of hands-on experience developing and maintaining an AWS-based application, plus in-depth knowledge of at least one high-level programming language. This certification validates your technical expertise in deployment, management, and operations on the AWS platform. This exam is for anyone with one or more years of hands-on experience operating AWS-based applications. This certification validates your advanced technical skills and experience in designing distributed applications and systems on the AWS platform. This exam is anyone two or more years of hands-on experience designing and deploying cloud architecture on AWS. This certification validates your technical expertise in provisioning, operating, and managing distributed application systems on the AWS platform. This exam is for anyone with two or more years of hands-on experience provisioning, operating, and managing AWS environments. This certification validates your technical expertise in securing the AWS platform. This exam is for anyone in an experienced security role. This exam tests your technical expertise in securing the AWS platform. This is for anyone in an experienced security role. This certification validates your technical expertise in designing and implementing AWS services to derive value from data. This exam is for anyone who performs complex Big Data analyses. This certification validates your technical expertise in designing and implementing AWS and hybrid IT architectures at scale. This exam is for anyone who performs complex networking tasks. This certification validates your technical expertise in building, training, tuning, and deploying machine learning (ML) models using AWS Cloud. This exam is for anyone who performs a development or data science role. This certification validates your technical expertise in building, testing, and publishing Amazon Alexa skills. This exam is for anyone who performs a role as an Alexa skill builder.